The 1.1.0 version of Pangu Jailbreak for iOS 7.1.1 is now available for users interested in jailbreaking their compatible iPhone, iPad, and iPod touch devices. Basically, if the device can run iOS 7.1.1, it can be jailbroken with the Pangu tool using a fairly straightforward process from a Windows PC or Mac, and that’s what this tutorial will demonstrate. Jailbreaking is certainly not for everyone and there are legitimate reasons not to do it, leaving the activity best reserved for advanced users who have a strong reason to jailbreak their devices, and preferably with some experience with the process. Be sure to understand the risks before attempting to perform this action with your own iPad, iPhone, and iPod touch hardware. This is not something to take lightly, and we think the average user should not jailbreak their devices. 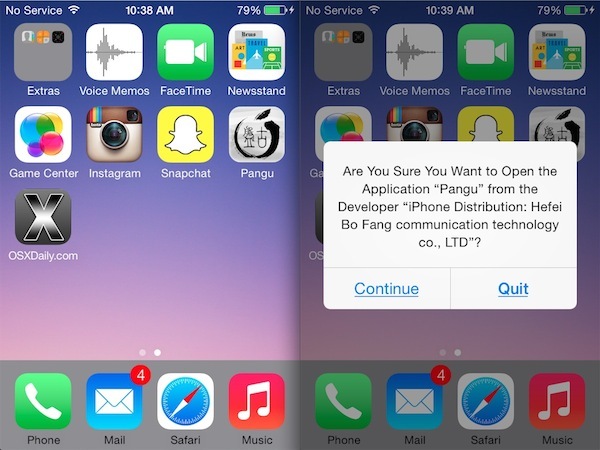 Update: The same version of Pangu tool also works to jailbreak iOS 7.1.2. Pangu 1.1.0 jailbreaks iPhone, iPad, and iPod touch, but we’re going to run through the tutorial showing jailbreaking an iPhone, the directions will be the same for all other devices and should be the same for Mac and Windows. When the device reboots, you’ll find the familiar brown Cydia icon waiting for you to use. Just launch Cydia and you’re ready to go (note the device may reboot again when Cydia is initially launched). Enjoy the jailbreak! Remember, you can always unjailbreak by restoring the iPhone or iPad through iTunes, this is why it’s so important to backup the device before beginning the process. Call me crazy but I see absolutely no reason to bother with a jailbreak anymore. What’s it going to do for me other than make my phone less stable and crash some more? I never get an answer to this, so nope, no jailbreak. Moreover I use jailbreak to save data of someapps that do not suport iCloud with DataDeposit. In iOS 6 i used Auxo, but with iOS 7 multitasking/control center I do not use it anymore. I am a user of an iPad, and despite seeing it less and less necessary evey iOS version (iOS 8 even better) I still find reasons for using it. Stability and crashing are not affected if you jailbreak, crashes and lag appears when using some buggy apps, but if you avoid them and use not to many extensions the experience is great. For me the biggest is Firewall IP. Don’t like the idea of apps “phoning home” without my knowledge – Game Center print the prime culprit. But agreed, overall the reasons are becoming limited. i try to jailbreak with pangu and it didn´t went trough. i have an iphone4 with ios 7.1.1 installed. runs ok just after the firs reboot of the iphone, and then, 4 red ???? appears, and fron there, nothing else happend. any ideas of what to do? Apparently the ???? indicates a “time-out”. I downloaded the English version and have the same problem with my iPad3. Not much can be done about this unless you restore your device from scratch without data to speed up the reboot process. Otherwise, perhaps they will add a few seconds to the wait time in the next release. I have already jailbroken. Getting swipe on and better multitasking is worth jailbreaking alone. At least for me. Now some more tweaks I personally use are for better default email client (way better), safari downloads and a torrent client on my iPad. Didn’t have any issues when I had jailbreak a couple of months ago, so I don’t think I will have them now. Accelerating very slow Apple animations on iOS7 is worth the jailbreak alone. I need some help, if anyone can: I jailbroke my phone with Pangu with iOS 7.1.1. Then I saw that iOS 7.1.2 was available, and I read that Pangu would work with 7.1.2; all I would have to do is jailbreak again. So I downloaded and upgraded to 7.1.2, but now Pangu refuses to jailbreak again, as it thinks my phone is already jailbroken, despite the fact that my phone no longer has Cydia. (The exact message is “iPhone5,1 with iOS7.1.2(11D257),already jailbreak.”) I attempted to restore to a backup from yesterday, but I still have 7.1.2 and Pangu still will not reinstall. If anyone can help, it would be greatly appreciated. 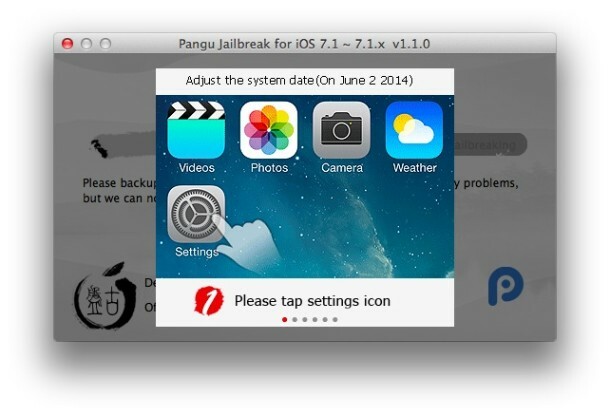 iOS 7.1.2 can be jailbroken with Pangu but it must start from an unjailbroken version. So the easiest thing to do is to first restore from the backup you made prior to the initial jailbreak, update to iOS 7.1.2, back-up again, then re-jailbreak with Pangu. Hope that helps! I figured it out; I think I was using the wrong option, but I found the option to restore factory settings and then restore. Then I was able to install Pangu again. Thanks! If you have already jailbroken your 7.1.1 device and upgrade to 7.1.2, Pangu 1.1 will see you as jailbroken already and wont let you re-jailbreak. The way to get around this is to use the old version of Pangu (1.0), this will work fine. 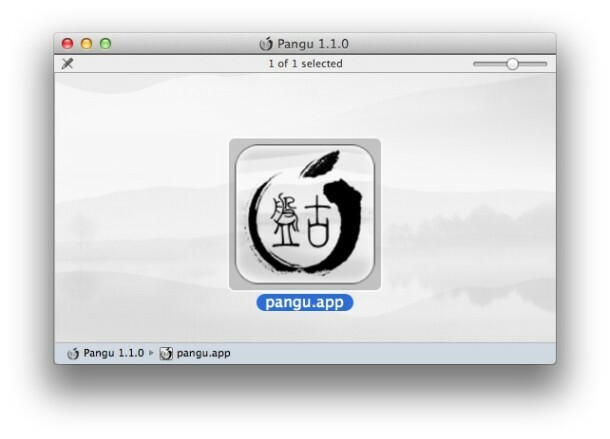 Pangu 1.0 times out with the four red question marks. I have restored twice and pengu still says already jailbroken. A Jailbrok? Wow cool! Is that like jailbreaking or jailbroken? Is that a new version? Can’t wait to “jailbrok” my jailbroken iPhone! I am on iOS 7.1.2 as well, iPhone 7.1.2, you jailbroke this one this way? Jailbroke iphone 4 GSM with pangu 1.2.1 and after the reboot..